Just occasionally a jazz solo becomes so well known that it transcends boundaries and becomes absorbed into the mainstream of popular music. Bobby Hackett on Glenn Miller’s “String of Pearls”, Stan Getz with Astrud Gilberto on “The Girl From Ipanema”, Paul Desmond on “Take Five” and Phil Woods on Billy Joel’s “Just The Way You Are” all come to mind in that regard. There is another that should be added to that exclusive little company because on 12 January 1956 in the Capitol studios on Hollywood’s Melrose Avenue, Milt Bernhart recorded one of the most famous trombone solos of all time. The occasion was the sessions Songs for Swingin’ Lovers! – Frank Sinatra’s masterpiece – and the tune was Cole Porter’s “I’ve Got You Under My Skin”, arranged by Nelson Riddle. The singer often referred to it as “Nelson’s Shining Hour” although his evocative “Folks Who Live on the Hill” chart for Peggy Lee in 1957 runs it pretty close. It is rumoured to have needed about 17 takes including a number of false starts until everyone was satisfied. Pianist Lou Levy called it, “One of the outstanding vocal arrangements” and at its conclusion the audience in the studio together with the orchestra applauded the principals – singer, arranger and trombone soloist. They obviously knew they had just witnessed something very special. A noteworthy feature of the arrangement after Sinatra’s first chorus is the ostinato or montuno by the trombone section – Jimmy Priddy, Juan Tizol, Milt Bernhart and George Roberts on bass trombone. 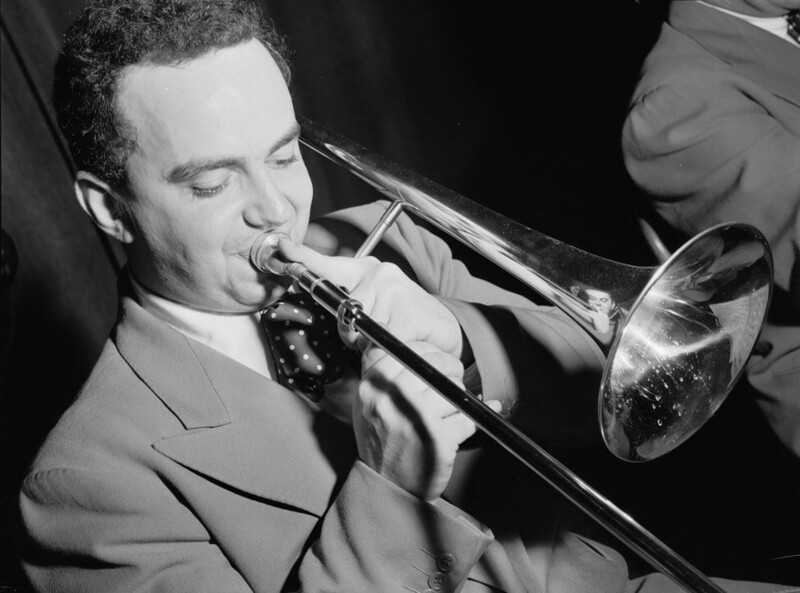 Roberts’ part is particularly noteworthy as the tension is increased throughout the 12-bar vamp which was inspired by Bill Russo’s “23 Degrees North, 82 Degrees West”, recorded by Stan Kenton in 1952 – which included George Roberts. Milt then launches into a swaggering eight-bar statement gloriously full of buoyant joie de vivre to claim his little piece of jazz history. At the end of the performance Sinatra invited him into the control-booth to listen to the playback, which was the greatest compliment he could give to the instrumentalist. Riddle was paid $150.00 (worth about $1,400.00 today) and in 2000 Songs for Swingin’ Lovers! was inducted into the Grammy Hall of Fame. Just as an aside, Quincy Jones once said, “Nelson wrote some of the greatest arrangements for vocalists I’ve ever heard”. Milt Bernhart was born in the small town of Valparaiso in Indiana on 25 May 1926. He began on tuba before switching to the trombone when he was 12. He told Gene Lees in Friends Along the Way that when he joined the union in Chicago he was called into president James Petrillo’s office. Petrillo took a luger out of a drawer and laid it on the desk saying, “This is the way it is”. Petrillo had been selected by Al Capone who apparently controlled all the unions in Chicago at that time. Bernhart worked briefly with Boyd Raeburn in 1942 at the Bandbox but his first steady job was with Teddy Powell. Boots Mussulli, Pete Candoli and Charlie Ventura were in the band and when Ventura left Milt recommended his friend, the 18-year-old Lee Konitz, as a replacement. This meant he had all the hot tenor solos to play. Years later Lee told me he found this very difficult. Apparently the first time he stood up to perform Powell walked off the stage and started banging his head against the wall. About a month later the band disbanded because of the leader’s tax problems with the IRS. Bernhart was drafted in late 1944 and eventually served in an army band based at the Presidio, San Francisco. On discharge in 1946 he played briefly with Tom Talbert’s rehearsal band in Los Angeles which included Art Pepper, Steve White and Claude Williamson. When he returned to Chicago, Konitz recommended that he start studying with Lennie Tristano. Bernhart told Lees that he found Tristano “very opinionated, with ideas of what you should eat and what you should wear”. The first tune Tristano usually played with students was “I Can’t Get Started”. Milt apparently found it difficult coping with Tristano’s advanced harmonies and one lesson was really enough for him. Years later, in 1971, Lennie was a guest on Leonard Feather’s blindfold test. His reaction to Milt’s solo on Stan Kenton’s “Solitaire” was mixed but complimentary: “A very good trombone player … a little too much vibrato to suit me but a lot of personal warmth”. 1946 was the year Bob Gioga telephoned with an invitation to join Kenton. Bob had been with Stan since the beginning in 1940 not only as a very reliable baritone sax man but also as the band’s manager, handling the payroll. Milt joined in Indianapolis and a few months later at a residency at the Paramount Theatre with Nat King Cole’s Trio and June Christy the section was expanded to five trombones. (Kenton really loved the instrument. Basie, Ellington and Herman usually managed with three sometimes four but never five). Bernhart told Lees: “Kai Winding was the star soloist … he made it very clear that he was going to play all the lead trombone parts. We got so we weren’t really speaking. He didn’t want me on the band and rarely said anything friendly”. Despite that, Milt felt that “Kai was as pure a jazz player as I knew and a good one. He was the most important player in the band”. Due to ill-health, Kenton disbanded for a while in 1947, which was when Milt rejoined Boyd Raeburn briefly in a band that included the Candoli brothers, Wes Hensel, Buddy DeFranco and David Allyn. In late 1947 Kenton organised a new band which performed under the “Progressive Jazz” banner. Bob Gioga called Milt again who was pleased to find that Winding would not be included as he was working on the Perry Como show. Milt was now the lead trombone and over the next few years his velvet tones were featured on several numbers including “Journey To Brazil”, “Somnambulism”, “Machito”, “Soliloquy”, “Salute” and one of the Stan’s biggest hits – “The Peanut Vendor”. He was also in the band for “Orange Coloured Sky”, which was another big Kenton hit featuring Nat King Cole. He left Kenton for a while around 1948 because of the heavy travelling although he did return occasionally. At Lee Konitz’s suggestion Milt joined Benny Goodman, who was forming a band with some of the younger musicians like Fats Navarro, Zoot Sims, Wardell Gray, Doug Mettome, Eddie Bert and Buddy Greco. Benny said he wanted to explore a more bebop approach and so the writing was handled by John Carisi, Gerry Mulligan, Chico O’Farrill and Tadd Dameron. However, Benny’s heart was not really in it, as he showed when he wanted Konitz to use a Hymie Schertzer-like vibrato. After several weeks of unpaid rehearsals Konitz, Navarro, Sims and Mulligan had all left and by the time Benny took the band to Las Vegas he had dropped most of the new charts, preferring to play his old standbys like “Let’s Dance”, “Don’t Be That Way” and “King Porter Stomp”. One packed Saturday night at the Flamingo, Goodman stopped the band and sacked Wardell Gray in the middle of “Memories of You” and an incredulous audience watched him walk off the stage carrying his tenor and clarinet. However, he had been billed as “The Featured Sax Star” and had a six-month contract so Benny had to keep him. He later switched Wardell to second tenor and Eddie Wasserman handled his solos while he worked out his notice. Milt told Lees that he began to “hate Benny Goodman”. He left the band later when they reached the Palladium in Los Angeles. He went back to Kenton for a while and then began working with Howard Rumsey at the Lighthouse with Shorty Rogers, Jimmy Giuffre and Bud Shank for $25.00 a night. One of the first recordings he did with Rumsey was “Big Boy”, which became something of a juke-box hit. It was a feature for some pretty raunchy blowing from Jimmy Giuffre who showed that he could have had a successful career as a rock ’n’ roll tenor-man in the style of Rudy Pompilli or Sam Butera if he had wanted. In January 1953 Milt was part of a nine-piece Shorty Rogers group that replicated the Miles Davis Birth of the Cool line-up with one change – Jimmy Giuffre’s tenor replaced Gerry Mulligan’s baritone. The date featured Art Salt who was better known as Art Pepper. Two months later Milt recorded again on Shorty’s seminal Cool and Crazy album and was featured on “Tale of an African Lobster” and “The Sweetheart of Sigmund Freud”. The 1950s was a prolific decade for Bernhart: Tom Lord’s jazz discography lists approximately 180 album appearances. It is unknown how many purely commercial dates he was called for at this time. His solo abilities are well showcased on a 1954 date with some of the most inventive soloists on the west coast – Don Fagerquist, Herb Geller and Jimmy Giuffre. Three months later he made his debut as a leader with an octet including Shorty Rogers, Bud Shank and Bob Cooper. Although Bill Harris and Jack Jenney are acknowledged influences on Milt’s style, his “Lover Man” feature here recalls some smooth, Tommy Dorsey-like legato magic. Fellow trombonist Roy Crimmins once told Steve Voce “Milt’s is the greatest sound that I have ever heard on the trombone”. A consummate sight-reader, Milt became a member of the Columbia Pictures Staff Orchestra in 1955. The door to the movie world had opened for several jazz musicians around that time after they performed on Marlon Brando’s The Wild One (1954) and Frank Sinatra’s The Man With the Golden Arm (1955). Milt also became a first call player for big-band studio dates backing artists like the Four Freshmen, Ella Fitzgerald, Frances Faye, Sergio Mendes, Louis Armstrong, Patti Page, June Christy, Harry Belafonte, Billy Daniels, Bing Crosby, Anita O’Day and Nancy Wilson, to name but a few. Musical taste changed quite radically in the 1960s – “Rock was everywhere” – and Milt, who could see the writing on the wall, was getting fewer calls for sessions. Synthesizers eventually became popular and there were fewer films being made needing large orchestras although he continued working on the Jerry Lewis and Glen Campbell TV shows. His last jazz recording was a 1971 Lalo Schifrin date titled Rock Requiem. Two years later he took over a travel agency business on West Sunset Boulevard and in 1983 he became president of the Big Band Academy Of America. In 2000 he was a guest at a Stan Kenton event in the UK where he talked about the band’s trombone sections over the years. He had his trombone with him and performed brief unaccompanied snatches of “How Long Has This Been Going On?”, “Solitaire” and “The Peanut Vendor”, demonstrating that his lip was still very much in trim. A charming and witty raconteur, he was also very complimentary about Ted Heath’s trombone section. An added bonus was his autobiographical lyric which he sang to the melody of Steven Sondheim’s classic hymn to survival – “I’m Still Here”, from the show Follies. After a period of ill health he died in Glendale, California, 22 January 2004. The Sinatra Family Forum lists 40 of the singer’s albums with Milt Bernhart in the orchestra performing under the batons of Jay Blackton, Billy May, Bill Miller, Lyn Murray, Sy Oliver, Nelson Riddle, Morris Stoloff and Axel Stordahl from 1953 to 1977.